Entering the 2015 season, the Stevenson University football program will try to build off its most successful season in the program's four-year history. 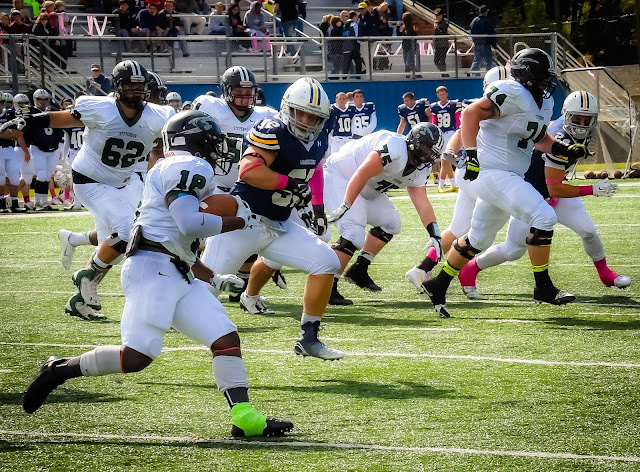 After compiling eight wins during their first three years combined, the Mustangs went 8-3 in 2014 and made their first postseason appearance -- earning a 29-7 victory against Bethany College in the ECAC Southeast Bowl. But this season, they know other teams will be gunning for them. "I think everyone is our rivals," said head coach Ed Hottle, who is entering his fifth season. "The whole [Middle Atlantic Conference] is our rival. You have to watch out for everybody." After finishing eighth in the MAC in 2013 and tied for seventh in 2012, Stevenson put together a 6-3 conference record last season -- good for fourth place. Its only conference losses in 2014 came against teams that finished ahead of it in the standings -- Widener (first), Delaware Valley (second) and Lycoming (third). This year, the Mustangs will be eyeing those matchups. "I'm looking forward to those in-conference games," senior safety Billy Lewis said, "just because we haven't beat them yet."